The "local foods" and "American artisan" foods movements have been gaining steam for some time now, but what makes me most excited are the collaborations that can occur between these artisans. I saw this a lot in Madison, where local farmers, cheese makers, butchers, chef, and brewers would combine talents to make a wild mix of hyper-local food products, dining events, and collectives. I would love to see this happen more in Pennsylvania, as for several years now I've been watching Oregon rise as the gold standard of culinary collusion. It also helps that this is the home of two major artisan food powerhouses: Rogue Brewery and Rogue Creamery (n.b. the companies are unrelated, but both took their name from Oregon's Rogue River Valley). From humble roots of a homebrewing dream, today Rogue Brewery is vertically integrated, growing its own grain and hops for their beer. They also have a range of their beers flavoring Rogue creamery's cheddar, and now they operates a distillery as wheel. On the dairy side, Rogue Creamery also looks to the local terrior, hand-harvesting syrah grape leaves to wrap their Rogue River Blue in, using local hazelnut shells to smoke their cheese wheels, and (of course) sourcing their milk from all local dairies. 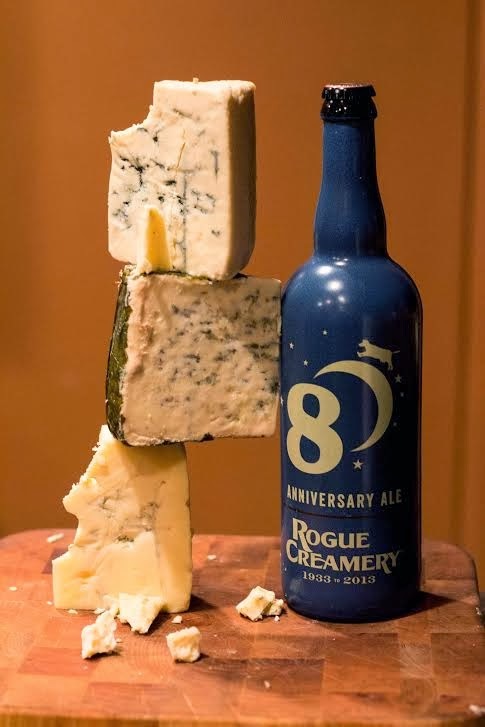 So I was really excited to try the ale celebrating Rogue Creamery's 80th anniversary (1933-2013). 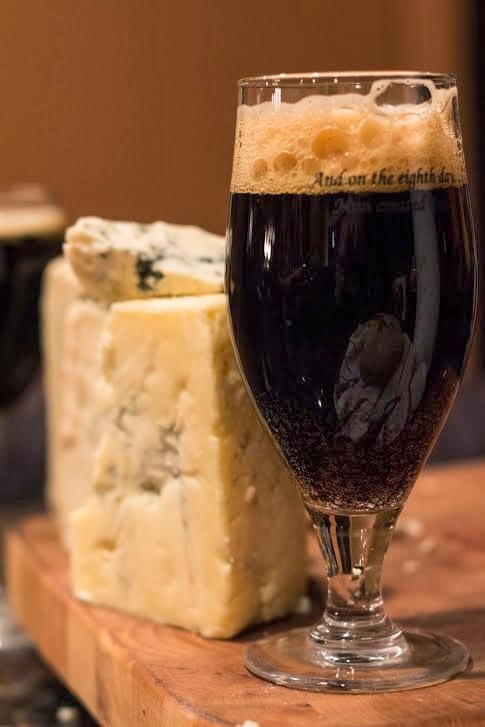 This beer was brewed by Rogue Brewery to pair with Rogue Creamery's cheeses . The beer is listed as an Imperial Stout and weighs in at 20 Plato (approx 8% abv) and 36 IBUs. It's very dark, with a roasted-coffee aroma and a toasted, malty flavor. The 80th Anniversary has some great bittersweet cocoa flavors, but it doesn't have that super dark, heavy flavor you'd get from a stout. To me it seems like a really well crafted porter. The chocolate notes come from a lot of roasted grains, but there's also cacao nibs in there as well. Rogue is best know for their signature line of blue cheeses. Frankly, I can't think of anyone that makes a greater range than Rogue, from the flagship Crater Lake Blue to their Oregonzola, Smokey Blue, Echo Mountain Blue, Rogue River Blue, Caveman Blue, or Flora Nell Blue. Naturally, this dark beer with its chocolatey notes was perfect with the salty, savory, bite of the sharp blue. A few years ago, I never would have thought chocolate and blue cheese, but the husky, bittersweet taste of cocoa can be a great foil to the intensity of blue cheese. But then, I'm clearly not the only one to think so, as Rogue's neighboring chocolate maker, Lille Belle, makes a line of truffles with Rogue's blue. All in all, I really enjoyed this pairing, and hope to see some similar collaborations happening here in central PA soon!